The foreign ministers of Armenia and Azerbaijan have met and agreed on the need to prepare their populations for peace and to discuss possibilities to cooperate economically. The optimistic statements following the meeting were a yet another sign of a marked decrease in diplomatic tensions between the two sides over the last few months. 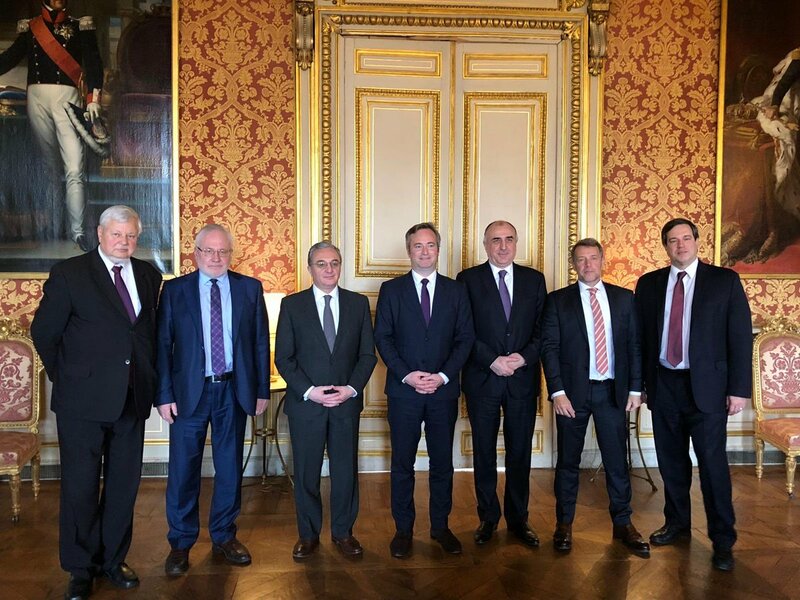 Foreign Minister of Azerbaijan Elmar Mammadyarov and his Armenian counterpart, Zohrab Mnatsakanyan, met January 16 in Paris, along with representatives from the OSCE Minsk Group, the international body tasked with facilitating negotiations between the two sides. It was the fourth meeting between the two since last year’s “Velvet Revolution” ushered in a new regime in Armenia. Following the meeting, the official statement included several unusual elements that cheered advocates for peace between the two sides. “Here is the most positive statement of the OSCE Minsk Group co-chairs in a very long time,” wrote Olesya Vartanyan, a Tbilisi-based analyst at the International Crisis Group, on Twitter. The two sides are locked in an unresolved conflict over the territory of Nagorno-Karabakh, over which they fought a war in the early 1990s. The two ministers, for example, “agreed upon the necessity of taking concrete measures to prepare the populations for peace.” If this were in fact done seriously it would be a remarkable development, as public opinion on both sides of the conflict has badly hardened in recent years. This has made the prospect of a peace deal – which would necessarily involve significant concessions on both sides – less and less likely, as an agreement would face a huge public backlash. The respective governments have done nothing to address this, but this new statement holds out the promise for that to change. The OSCE negotiators also “underlined the importance of possible mutually beneficial initiatives designed to fulfill the economic potential of the region.” It’s not clear what this would mean, but if implemented it would be a big shift for Azerbaijan, which has made economic isolation of Armenia one of its key strategies in the conflict. President Ilham Aliyev recently reiterated this point: “We will use and are using all means to isolate Armenia until our lands are liberated,” he told a meeting of government officials on January 11. One potential issue that the two sides could address is access for Armenian cargo to the new Baku-Tbilisi-Kars rail network, Vartanyan told Eurasianet. Armenia has built a large new border point near the rail line in order to take advantage of the new railroad but it remains uncertain whether or not Armenian goods will be able to use the route, Vartanyan said. The ministers also agreed to work toward a summit between Aliyev and Armenian Prime Minister Nikol Pashinyan. The two leaders met briefly on the sidelines of a Commonwealth of Independent States event in Dushanbe last year. That short meeting resulted in the establishment of a communications channel that the OSCE earlier credited for a “significant decrease in ceasefire violations and reported casualties” on the front line between the two sides. Pashinyan’s coming to power has inspired optimism in Baku that the long-stalled negotiation process could be reinvigorated. The Azerbaijani government has accordingly shuffled some personnel to be able to take advantage of that prospect and has appeared to have toned down its often-hostile rhetoric against Armenia. The Armenian Ministry of Foreign Affairs released a brief video report from the meeting.